SAN JOSE, Calif., Oct. 3, 2017 /PRNewswire/ -- Xilinx, Inc. (NASDAQ: XLNX) today announced delivery of its Zynq® UltraScale+™ RFSoC family, a breakthrough architecture integrating the RF signal chain into an SoC for 5G wireless, cable Remote-PHY, and radar. Based on 16nm UltraScale+ MPSoC architecture, the All Programmable RFSoCs monolithically integrate RF data converters for up to 50-75 percent system power and footprint reduction, and soft-decision Forward Error Correction (SD-FEC) cores to meet 5G and DOCSIS 3.1 standards. With silicon samples already shipping to multiple customers, the early access program for the Zynq UltraScale+ RFSoC family is now available. Applications addressed by the Zynq RFSoC family include remote radio head for massive-MIMO, millimeter wave mobile backhaul, 5G baseband, fixed wireless access, Remote-PHY nodes for cable, radar, test & measurement, SATCOM, and Milcom / Airborne Radio and other high performance RF applications. Zynq UltraScale+ RFSoC devices now make viable the most bandwidth intensive systems for next generation wireless infrastructure. 5G imperatives—ranging from 5X bandwidth, 100X user data rates, and 1000X greater network capacity—would be unattainable without breakthroughs at the system level. The integration of discrete RF data converters and signal chain optimization in Zynq UltraScale+ RFSoCs allow remote radio head for Massive-MIMO, wireless backhaul, and fixed wireless access to realize high channel density with 50-75 percent power and footprint reduction. Multiple integrated SD-FEC cores enable 10-20X system throughput vs. a soft core implementation for 5G baseband within stringent power and thermal constraints. Similarly, in next-generation cable broadband services, Zynq RFSoCs provide a combination of small form factor, power efficiency, and hardware flexibility to enable Remote-PHY systems. Distributed access architectures push DOCSIS 3.x PHY functionality from the centralized headend equipment to the Remote-PHY node located closer to consumers. By replacing inefficient analog optical transmission with ubiquitous Ethernet transport, network capacity, scale and performance improves. With RF integration and an LDPC FEC-enabled signal chain, RFSoCs ensure flexible R-PHY deployment for greater spectral efficiency prescribed by DOCSIS3.1. Zynq RFSoCs also deliver the needed performance and adaptability for key government programs such as the Multi-function Phased Array Radar (MPAR) initiative to combine the functions of several national radar networks into a single system for aircraft and weather surveillance. Because these leading edge systems must operate in real time, the inherent integration of RF-Analog makes the Zynq UltraScale+ RFSoC an ideal solution. Zynq RFSoC devices are currently designed into the Rockwell Collins' Common Module beamformer for the DARPA Arrays at Commercial Time Scales (ACT) program, which aims to shorten design cycles and in-field updates, while pushing past traditional barriers for delivering radar arrays. Zynq UltraScale+ RFSoC device samples are shipping now. 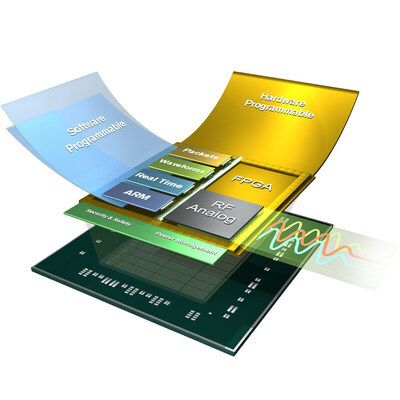 Vivado® Design Suite early access supporting Zynq UltraScale+ RFSoC devices is now available. Customers interested in the Zynq UltraScale+ RFSoC early access program can contact their local Xilinx representative. For more information, please visit: xilinx.com/rfsoc. © Copyright 2017 Xilinx, Inc. Xilinx, the Xilinx logo, Artix, ISE, Kintex, Spartan, Virtex, Vivado, Zynq, and other designated brands included herein are trademarks of Xilinx in the United States and other countries. ARM is a registered trademark and Coretex is a trademark of ARM in the EU and other countries. All other trademarks are the property of their respective owners.